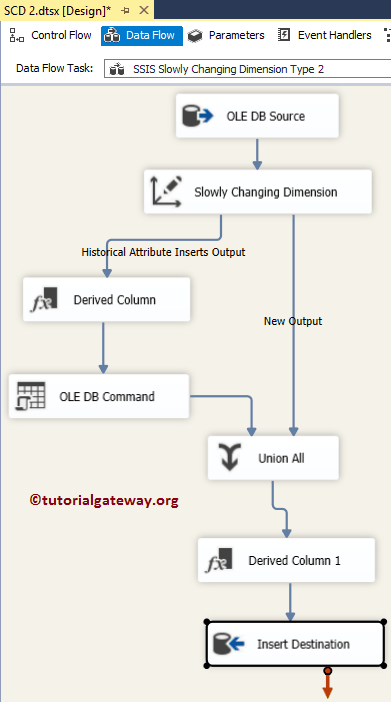 The Slowly Changing Dimension transformation in SSIS coordinates the inserting and updating records in data warehouse dimension tables. 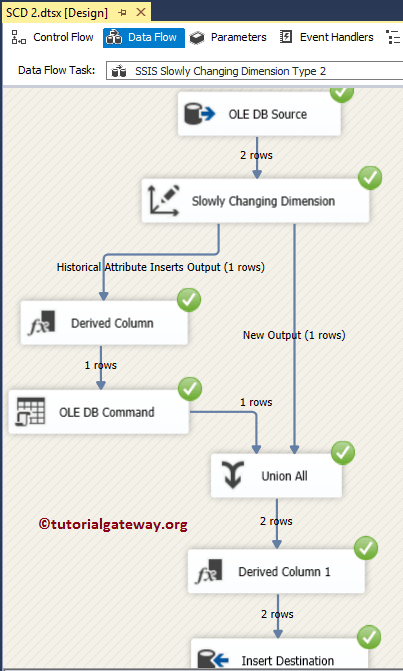 This transformation supports four types of changes, and in this article we will explain about SSIS Slowly Changing Dimension Type 2 (also called as SCD Historical attribute). 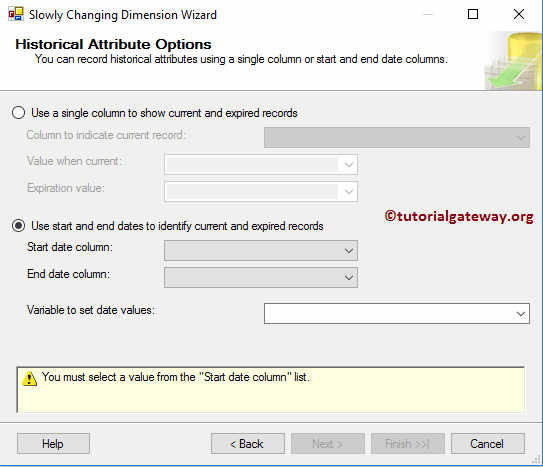 SSIS Slowly Changing Dimension Type 2: If you want to maintain the historical data of a column then mark them as Historical attribute. If your Dimension table members (or Columns) are marked as Historical attributes then it will maintain the current record and on top that, it will create new record with changing details. This type of changing is very useful, For example if we want to maintain the Employee previous and current city or Employees previous department and current department then we can mark these column as Historical attribute. Before we step into the example, let us see the data inside our Employees Dimension table. NOTE: Since SSIS Slowly Changing Dimension Type 2 is maintaining historical data, as the data grows it will be very difficult to maintain the data. Following screenshot will show you the data inside our [Employees] table. You can get the same data by selecting TOP 10 records from [DimEmployee] table in [AdventureWorksDW2014] database. Below image shows the data present in the [EmployeeSource] table and we are going to update or insert these two records into the [Employees] table. If you observe the above screenshot, Department Name of the EmployeId (253022876) is different from original value (it has changed from ‘Marketing’ to ‘Sales’ and We have a new record with EmployeId 253022870. Our task is to insert the new record and update the Department Name of the second record. 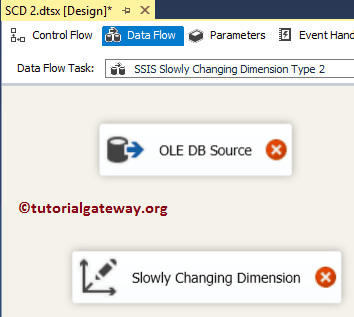 STEP 1: Open BIDS and Drag and drop the data flow task from the toolbox to control flow and name it as SSIS Slowly Changing Dimension Type 2. STEP 3: Double click on OLE DB source in the data flow region will open the connection manager settings and provides space to write our SQL statement. Here we are using already created OLE DB Connection Manger and EmployeSource table present in the [SSIS Source] as the Source table. 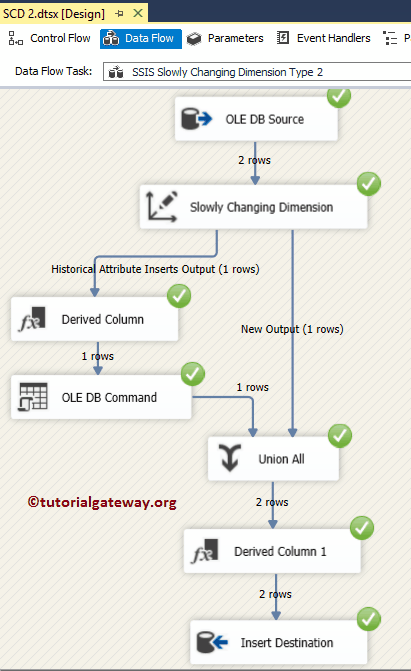 If you find any difficulty to configure the OLE DB Source then please refer OLE DB Source in SSIS article. In order to use the OLE DB Source data, Please Drag & drop the blue arrow from OLE DB Source to Slowly Changing Dimension Transformation to connect the data. STEP 6: Select a Dimension Table and Keys: This page is used to configure the Dimensional table information. 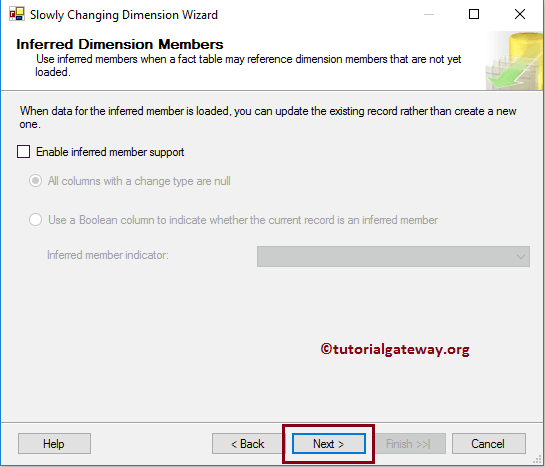 Connection Manager: This option is used to provide the connection to the dimension table. Here we are using the already created OLE DB Connection Manger which is connected to [SSIS Source] database present in our SQL Server 2014. You can change the connection manager settings by clicking the New button. Table or View: This option is useful to select the Data Warehouse Dimension table or View on which you want to perform slowly changing operation. Here we are selecting Employees table. Input Columns: Columns that are coming from the OLE DB Source. Dimension Columns: Columns that are available in Employees Dimension table. Change Type: Select the change type. In this example, we are keeping the default Fixed attribute as change type for Birth date, Login Id columns and we want to maintain the historic data for Department Name so we selected this as Historical attribute. TIP: By default the wizard will assign the Fixed attribute as the Change Type. But you can change them as we shown above. 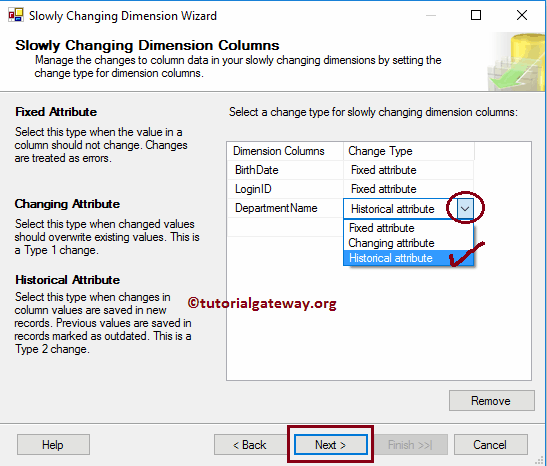 STEP 8 – Fixed and Changing Attribute Options: This page has two option and we already explained the first option in our previous article so, Please refer SSIS Slowly Changing Dimension Type 0 article. We will explain the second option in our next article. 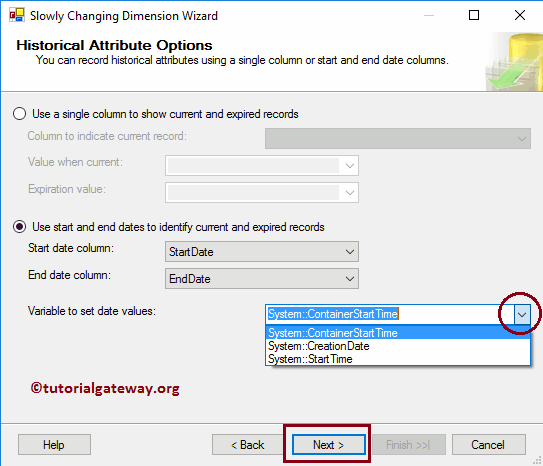 STEP 9 – Historical Attribute Options: In order to maintain the historic data we have to configure the following option. First, we will show you the configuration setting of second option and later we will show you the other option. 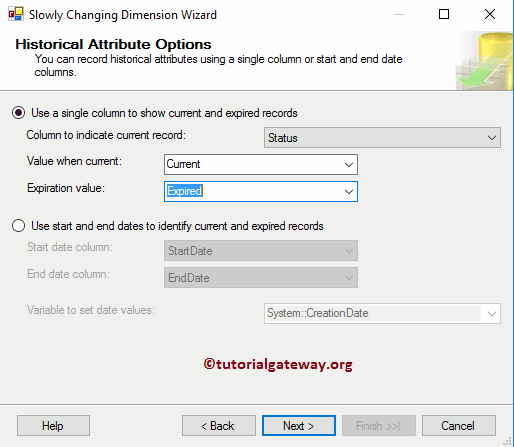 SSIS Slowly Changing Dimension Type 2 using Start Date and End Date: Please use Use start and end dates to identify current and expired records option to use the start and End dates. Start Date Column: Here you have to select the starting date of the records. For example, Employee Joining date or Production start date etc. End Date Column: Here you have to select the end date of the records (generally the values will be NULL). For example, Employee End Date. Variable to set date values: Please specify the Starting date of the newly inserting record & End date of current record. From the below screenshot you can observe that, we selected the StartDate as the Start Date Column, EndDate as the End Date Column and container starting time as the Starting date of the newly inserting record. Once you click on the finish button our Data Flow will automatically changed. If you observe the below screenshot, it added the Derived Column Transformation to set the End date as container starting time, OLE DB Command Transformation to update the End date (Null value) to container starting time, Union All Transformation to combine the historical Data and New inputs, Derived Column Transformation to set the New record Start date as container starting time, OLE DB Destination to insert new records into the Dimension table. (Optional Step): Let us double-click on the Derived Column Transformation to check the automatically generated expression to set the End date. (Optional Step): Let us double-click on the OLE DB Command Transformation to check the Update statement that was created automatically. (This is an Optional Step): Let us double-click on the Derived Column Transformation to check the automatically generated expression to set the new records start date. (Optional Step): Let us double-click on the OLE DB Destination. And check the automatically created destination (table name and connection manager setting and mappings). From the above screenshot you can observe that, though there are two rows coming from the OLE DB Source. One row is inserted directly and other row is maintained the historical information and then inserted. Added New record of Employee Alternative key 253022870. Added New record for Employee Alternative key 253022876 with updated department name. Value when Current: Here you have to specify the value that will appear for the current records. End Date Column: Here you have to specify the value that will appear for the expired records. 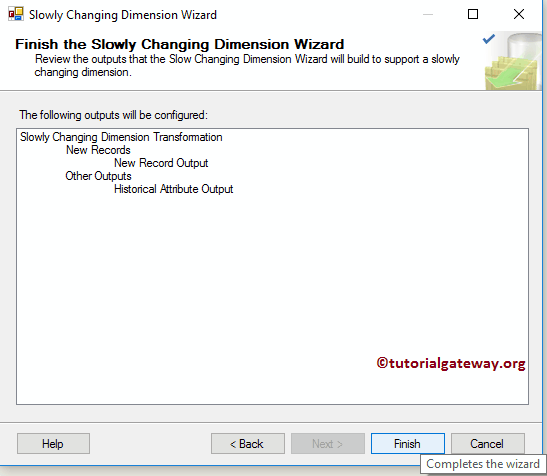 Click OK to finish the SSIS Slowly Changing Dimension Type 2 package design and let us run the package. Added New record for Employee Alternative key 253022876 with updated department name and set the status as Current.